Over the last few months, I’ve offered examples of how you can obtain instant upfront income by selling put options on stocks. By selling an out-of-the-money put option at a strike price set well below the current price of the stock, you not only get the cash immediately, but you also set yourself up to buy a quality stock on the cheap. But some of these put options that can be sold are so ridiculously out of whack that it almost feels like stealing candy from a baby. Look, if you’re going to play the game, caveat emptor! We’ve used Amazon.com (Nasdaq: AMZN) before only because it’s such a great example of the lunacy of what people will pay. AMZN is trading around $1,927 per share as I write. 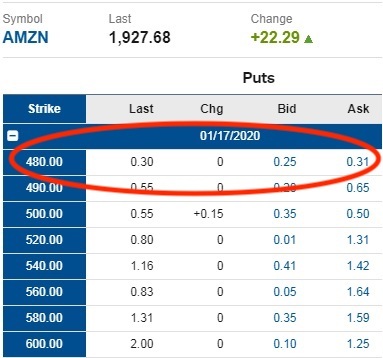 The January 2020 $480 put option is paying out roughly $28 per each contract sold. It means that someone is thinking that AMZN can drop to $480 over the next 15 months. It also means they’re willing to pay you right now to commit to buy it at that price. Are you looking to get your hands on AMZN at $480? That’s a $1,447 per share drop, or roughly 75% of its value in the next 15 months. Who are these crazy people? Why do they believe AMZN will fall that far? And why are they so willing to pay you for their bet? Here’s the answer to all three: Who cares? If I know ahead of time what stock I want to buy and what price I want to pay, I can sell the corresponding put option for cold, hard cash. I know some of you are worried about another 2008-style stock-market meltdown. But c’mon… buying AMZN at a 75% discount? How much more do you want? By the way, the chance of AMZN falling that far? It’s 0.038%. Let’s take a look at another example, Netflix (Nasdaq: NFLX). NFLX is currently priced at $364 per share. The January 2020 $95 put option (the lowest strike offered) is paying out roughly $71 per contract to anyone willing to step up and buy 100 shares at $95 each. 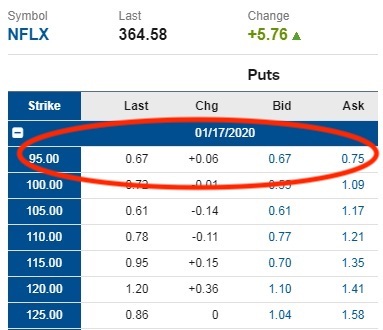 Now, you’d only have to follow through on that obligation if NFLX falls to that level by January 2020. That’s a $269 per share discount, or roughly 74% below its current value. Regardless of whether the stock falls that far, the put-seller gets the upfront cash no matter what. The chance of NFLX falling that far, by the way, is 0.577%. Finally, how about Adobe Systems (Nasdaq: ADBE)? The stock is currently priced at $262 per share. The January 2020 $75 put option is priced at roughly $25 per contract. If your wish is to buy ADBE shares at $75 per in the next 15 months, someone is willing to pay $25 for that obligation. That’s a $187 per share discount, or roughly 71% below its current value. The chance of ADBE falling to that level by January 2020 is 0.020%. These are insane opportunities for such high-quality stocks. I’m pretty confident these three companies will still be standing and generating profits in the next 15 months. But gamblers in the options markets think differently. I don’t care what anyone says; getting an opportunity to buy stocks like these for 75% off – plus getting paid for that opportunity – is literally money in the bank. It’s a serious question, though: Why are these people practically giving money away for such low-probability events? They actually think these stocks can fall that far and are willing to speculate on it. Market-makers are obligated to provide “bid” and “ask” quotes, even for levels that seem so farfetched. Whatever the reason, I’m happy to capitalize on that ridiculous source of money any day. These are exactly the types of opportunities my colleagues will talk about at the Irrational Economic Summit in Austin this October.